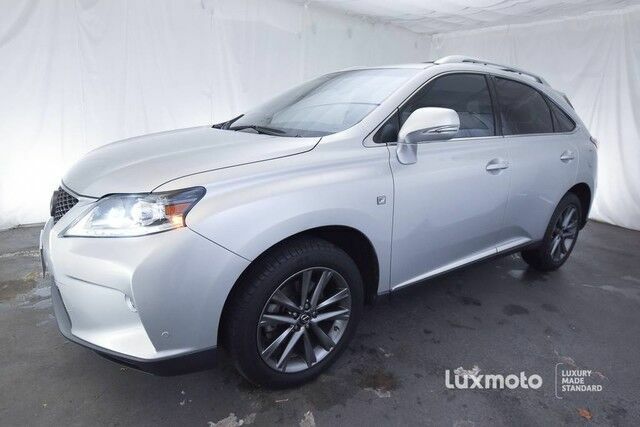 **Carfax Certified 1-OWNER**, **FACTORY WARRANTY REMAINING**, Lexus RX 350 F-Sport, **BLIND SPOT MONITOR**, **AWD ALL WHEEL DRIVE**, **HEATED/COOLED SEATS**, **NAVIGATION**, **ENHANCED BLUETOOTH w/SMARTPHONE INTEGRATION**, **SATELLITE RADIO**, **MOON ROOF**, **MUSIC STREAMING**, **USB & AUX PORTS**, Power Rear Lift Gate, Power Tilt/Telescoping Steering Column w/Auto-Tilt Away, Proximity Key For Doors And Push Button Start, Radio: Lexus Premium AM/FM/DVD/HD Audio System -inc: WMA/MP3 Capability, 5.1 Surround Sound, 12 Speakers, Bluetooth Streaming, Advanced Voice Recognition, Aux And iPod/USB Input Plugs, Digital Signal Processing w/Automatic Sound Levelizer (ASL), Electronic Crossover Network, Gracenote Music Management System, Integrated SiriusXM Satellite Radio Receiver, MP3 Sound Enhancement, Rear Glass-Imprinted Radio Antenna w/Separate FM Diversity Antenna, Text To Speech SMS w/navigation, Theft-Deterrent Design And Siri Eyes Free Mode For iPhone 4S/5/5C/5S, Navigation Package (HDD Navigation System w/Advanced Voice Command, Bluetooth Hands-Free Phone, HD Radio w/iTunes Tagging, DVD Player, Lexus Enform Safety Connect 2.0, Rear Back-Up Camera w/Dynamic Gridlines, Telematics, and XM NavTraffic/XM NavWeather/XM Sports), Dual-Zone Automatic Climate Control, Xenon HID Automatic Headlights, LED Daytime Running Lights, Fog Lamps and much more. Come take a look at this Stellar F-Sport in our Indoor Showroom by Appointment. The Lexus RX us a luxurious crossover utility vehicle that stands out for offering an extremely comfortable, quiet interior with none of the rugged styling cues that are flaunted by some other luxury-brand SUVs. The Mark Levinson premium sound system in the RX is a standout, even among the others in the class. The RX family also has an excellent reputation for high resale value and long-term reliability. The RX 350 F Sport is the model to get for those who want more of a sporty driving feel in this family, while those who embrace technology may want to go with the RX 450h hybrid and its excellent 32-mpg city fuel economy rating. This model sets itself apart with smooth ride, impressive audio and infotainment systems, excellent fuel economy with the RX 450h hybrid., Elegant look and feel, versatility and interior space, and tight, quiet interior.